There Are Two Basic Types of Manual Juicers: Citrus Juicers and Wheatgrass Juicers! Citrus Juicers. 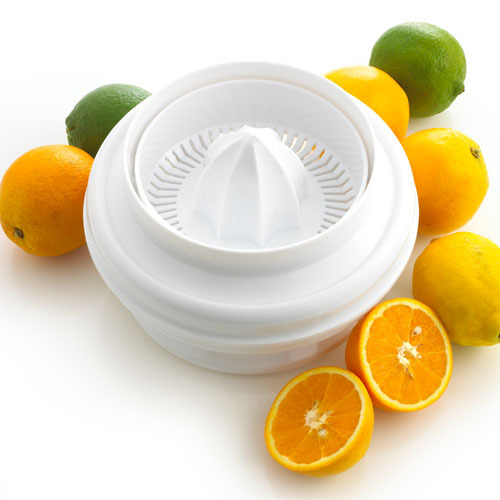 Photo Of A Manual Citrus Juicer! Photo Of A Motorized Citrus Juicer! A citrus juicer is one of the most common manual juicers. These juicers have been around the longest and are the simplest to operate. They are used to juice oranges, grapefruits, limes and lemons. A citrus juicer can cost as little as $10 for a hand-operated unit, to as much as $150 for an electric-motorized one. When using a citrus juicer, you cut your citrus fruit in half across the middle and not from the stem-end to the other end. When cut this way, the fruit's center fits nicely on the tip of the cone of the citrus juicer(see picture). On a hand-operated unit, you press the fruit down on the cone and turn it to squeeze out the juice. An electric unit actually turns the cone onto which you push down the fruit requiring less effort on your part, and is especially useful when you want to make large quantities of juice. To get the most juice yield out of your citrus, use fruits at room temperature. Roll the fruit with your palm on your kitchen counter-top a few times to soften it up and break it down a bit before you juice. Refreshing Tip For Extra Juice: When you have extra citrus juice, put it in an ice cube tray and freeze it. It makes a great juice popsicle or you can put them in your ice tea or use them in other juices for extra great taste! Wheatgrass Juicers Are Specially Designed For Wheatgrass Juice Extraction! When To Purchase A Wheatgrass Juicer! Purchase a Wheatgrass juicer only if you are drinking Wheatgrass for healing purpose and wants a separate juicer just for this purpose. Otherwise, you are better off purchasing a multi-purpose gear or "masticating" juicer that can juice other fruits and vegetables. I suggest you purchase only those made of stainless steel or plastic. Forget the iron ones as these can rust. Take a look also at the gear or masticating type juicers for Wheatgrass juicing. You need to be aware that these juicers tear, grind and crush the wheatgrass, while a Wheatgrass juicer presses and squeezes the wheatgrass fiber. Advantages Of A Manual Juicer! 1. They are cheap compared to all the other electric-operated juicers. 2. Since they do not require electricity, they are portable and easy to travel with. 5. Cleaning up is easy and fast. Disadvantages Of The Manual Juicers! 1. They are limited in the types and amounts of fruits or grasses that they can juice. 2. Extra effort and patience is required when using these types of juicers. 3. It take a long time to make a little juice. Click on the link below to visit Dr. Eichenauer's Amazon.com Juicing Store. When there look to the menu at the right to choose the category of Juicer you would like to explore. Click here to visit Dr. Eichenauer's Juicer and Book Store. Please click here to leave Manual Juicers and return to Juicing For Health. Click Here to leave Manual Juicers and Return to my Home Page Holistic Medicine Works!